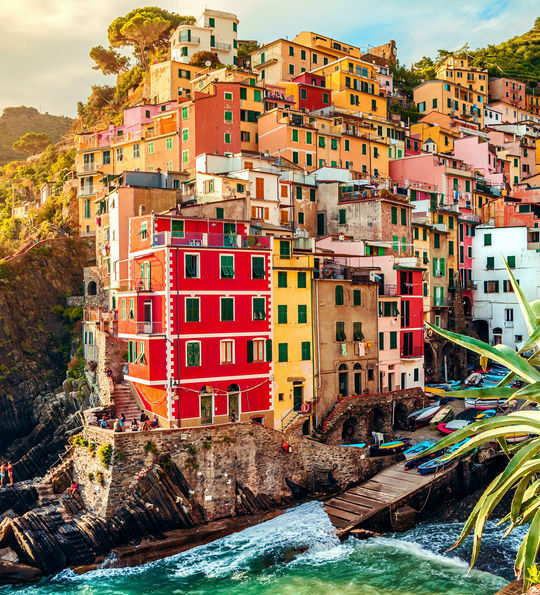 The coast of Italy has long been known as the epitome of romance and charm, but this is perhaps nowhere more apparent than among the pastel-hued villages, rugged cliffs and charming yacht-lined harbours of world-famous Cinque Terre. Explore it all on this tailor-made, luxury trip, enjoying everything from wine tasting in world-class vineyards to sampling local bruschetta in cosy trattorias. You'll start among the palatial history of Genoa before ultra-scenic included train and ferry journeys bring you to the romantic cobbles and fishing harbours of Cinque Terre’s most famous villages, culminating your evenings in five-star hotels that boast superb spas and gourmet restaurants. Begin your trip in true style with an included chauffeured drive to the airport and VIP airport lounge access before your flight from the UK to Genoa. Upon arrival, enjoy a private transfer to the opulent, 19th-century Grand Hotel Savoia, just moments from Genoa's historic downtown. Indulge in the fabulous spa before a pre-dinner drink on the panoramic rooftop terrace – a wonderful perfect prelude to an al fresco dinner in the spectacular restaurant, offering the likes of ultra-fresh seafood and traditional Italian fare. After breakfast, depart Genoa for La Spezia by train, for which we’ve included a ticket. 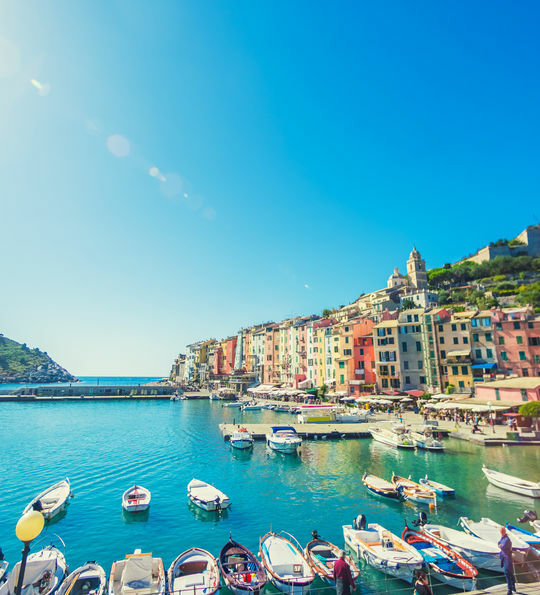 On arrival, enjoy a private transfer from the colourful clifftop houses of La Spezia to the five-star Grand Hotel Portovenere, nestled among the sparkling bays of the eponymous village and surrounded by clifftop trails, hidden beaches and deep caves. The hotel itself is just as spectacular as its surrounds, particularly the veranda restaurant that looks over the charming hotchpotch of the town – the likes of mussel spaghetti, buratta with aubergine and grilled scallops best enjoyed before an aperitivo at the onsite Venus bar and its seaside terrace. The next two days will see you explore the myriad charms of this region – perhaps head on an included ferry ride to reach the charming harbour of Monorola clinking with yachts, hike the hugging cliffside trails, or while away the hours on pebbly azure-framed beaches. 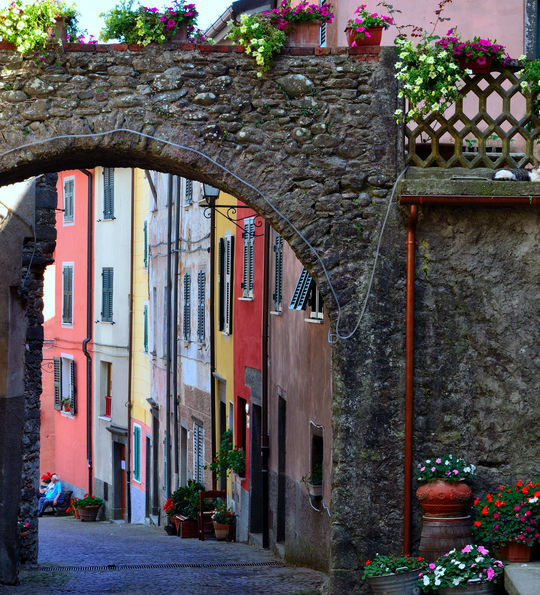 We've also included a Cinque Terre pass for unlimited access to the walking trail that winds between villages – don't miss a visit to Vernazzo's ancient seaside houses and winding cobbles, and Corniglia, the region's highest village. A hike to the top (it's unreachable via boat) is rewarded with, unsurprisingly, spectacular ocean vistas. 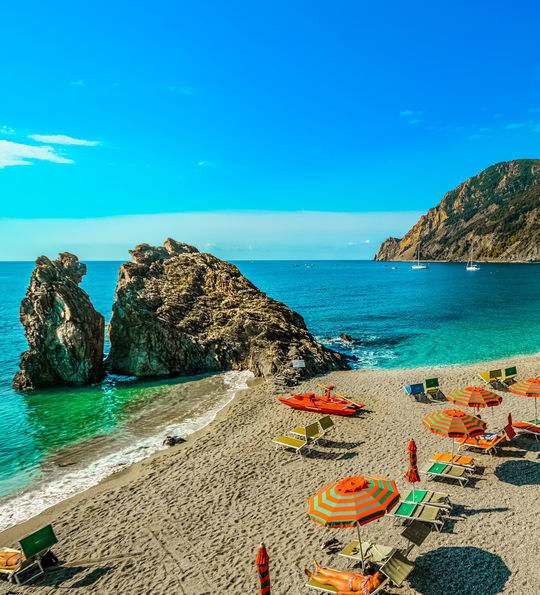 On day four head to Monterosso, all quaint beaches and trattorias offering fresh seafood – making for a wonderfully languid few hours. In addition, we've included wine and food tasting at rustic wine bar Enoteca Internazionale – enjoy a range of local bruschetta washed down with local Cinque Terre white wines. After breakfast, private transfer back to La Spezia and then catch the train to Genoa. Discover the palatial history of Via Giuseppe Garibaldi or the grand square, and don't miss an amble among the cobbled streets before reaching the UNESCO-listed Palazza dei Rolli. Head back to your hotel, the Grand Hotel Savoia, for your final evening in this historic city at the hotel's incredible restaurant, or head out to the port for myriad eateries and wine bars. After breakfast, take your private transfer from Genoa to the airport to catch your flight back to the UK.